I cannot tell a lie, I like Doctor Who. I like Doctor Who in the way the Pope likes Catholicism, that fish like water and that K9 likes a flat surface. I own box sets. A TARDIS tea cup and pot. I have the wherewithal to make Darlek biscuits. I’m a fan. And like most fans, I hanker after a picture of myself with a TARDIS for social media purposes. The main ways to get a TARDIS profile picture are to go to a BBC building tour, or one of those Doctor Who Experience thingys. Both cost more than a tenner these days, but there is a third way. Get thee to Earl’s Court Tube Station, ladies and gentleman. Outside the Tube station you will find a replica police box/ TARDIS, built in 1996 by London Transport and commissioned by the Mayor of Kensington and Chelsea, who thought it would be useful for citizens to have a phone box they could use to contact the police in moments of disaster. The move was unsuccessful – in the same way the police found that radios were better than police boxes, we citizens preferred mobile phones. 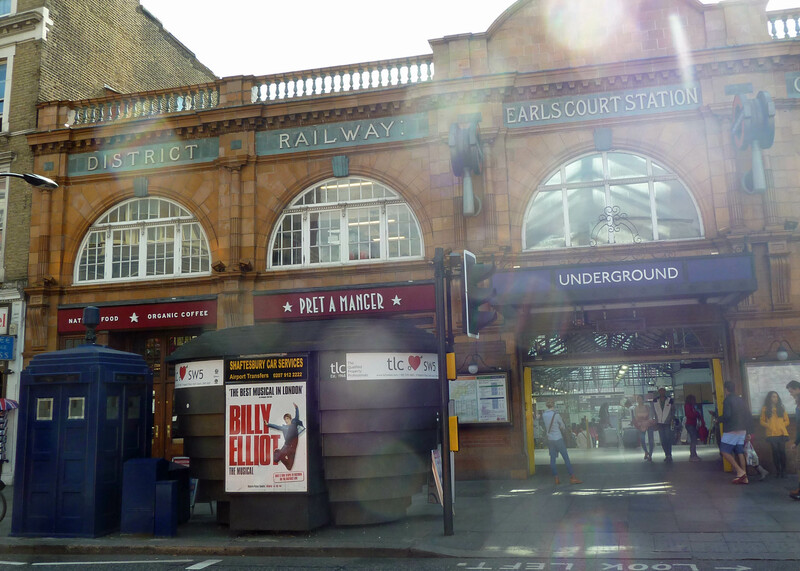 But nevertheless, the Earl’s Court police box remains, ripe for profile pictures. I ran to Earl’s Court for my TARDIS selfie, perhaps unwisely. I have three settings on photos: eyes shut, eyes staring weirdly or eye rolling, apparently. Adding sweat to that mix did not help. But here we are. Me, staring weirdly in front of a TARDIS, surrounded by people staring weirdly at me. You might ask why I like Doctor Who so much I am willing to take photos of myself in crowded suburban streets to celebrate it. Like so many British people, I’ve grown up with Who. He is an old friend. In times of crisis and disaster, a good episode of Doctor Who bucks me up no end. I like the joie de vivre of the thing. The unrelenting silliness. And the fact that, like so much great science fiction, there’s something rather fine about the Doctor – his kindness and his never-ending quest for adventure. It is inspired by Who I return to London blogging. Next time, we go to another small wooden structure which appears to be bigger on the inside – a taxi driver café. 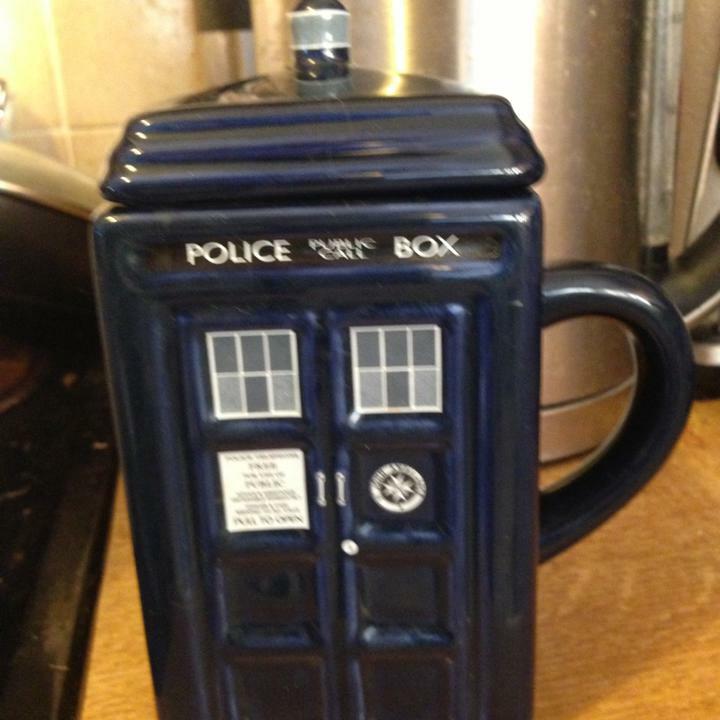 i have a TARDIS mug just like that and i love it. it’s with me here at work, always! Ha! Hope you’re well (and that you both enjoyed the Capaldi). Can’t wait to see him take on a Dalek. Still want to know who Missy is. Theories abound.